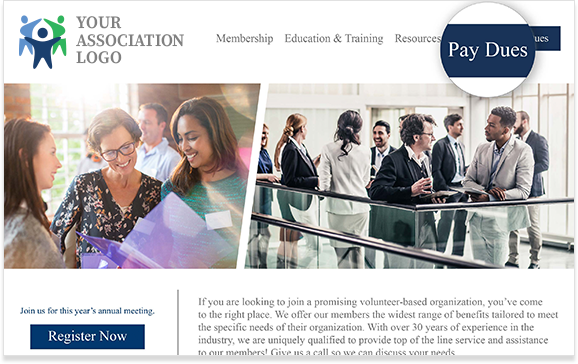 Let members pay directly from your association's website for a simple, streamlined payment experience. Reinforce to your members the value of your association’s website and the numerous solutions they can find there. Include a bill-pay button in one or multiple spots on your site, based on your needs and your members' behavior. Whether you manage your own website or work with a web developer, adding a payment link or button is simple! You’ll be up and running in no time, giving members yet another convenient way to easily pay online. Our support team can provide logo options to choose from, or you can use your own custom button. Add the button to your header, footer, or both using your website’s content management system. Copy your payment page link from your AffiniPay account and apply it as a hyperlink on your payment button.